It didn’t seem to matter to Støre that unemployment today is lower than it was a year ago or that Norway’s economy has survived one of its worst setbacks, when oil prices collapsed just a year into Solberg’s term. Even though the tourism and seafood industries are booming, and the oil industry is investing again at far lower costs, Støre saw nothing but problems. He claimed that real unemployment remains high and job growth creation had gone down, as had the portion of the population that’s employed. Støre pointed to conflicts between Norway’s urban and outlying areas, without mentioning that they’ve been stirred up and, argue some, exaggerated by his potential government partner, the Center Party. Støre also claimed that “differences” between people have gone up while taxes on those who have the most have gone down. 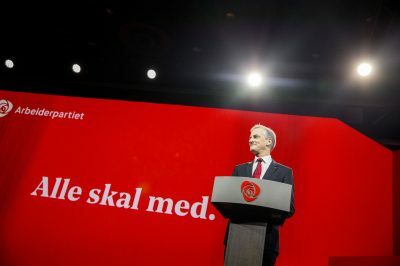 His remarks were met by long and loud applause by the roughly 300 Labour Party delegates meeting at Folkets hus (The People’s House) in Oslo for the national meeting that runs through Sunday. It began under a cloud of poor, even “catastrophic” results of public opinion polls, which show Labour losing lots of voters, mostly to their rival/partner Center Party. That worries many within the party, and it’s Støre’s job to rally his troops and mobilize voters before the next parliamentary election on September 11. “Jobs for everyone is job-number-one,” Støre declared. He claimed that Norway’s private sector has barely created any new jobs since the last election, and he launched two “new initiatives” that he thinks will contribute to new job growth: A value-creation program for maritime businesses, and a plan to make Norway a forerunner in digitalization and health care. Norway already ranks as one of the world’s most highly automated countries, with the public sector forcing Norwegians over to electronic communication for everything from filing tax returns to doing banking. Norway’s largest bank, DNB, run by Labour Party veteran Rune Bjerke who was appointed during the last Labour-led government, has closed branches and slashed hundreds of jobs over the past few years and is now promoting the use of robots. Støre didn’t mention all the job losses at DNB, in which the state owns a 34 percent stake, or at other large firms like Statoil. But he contended on Thursday that Norwegians collectively own the resources “that make Norway, Norway. Together we can create new businesses, new industry, new jobs, like those created by hydroelectric power and oil.” He believes hav og helse (the sea and health care) can be the next new areas where Norway can prosper. The fishing industry, fish farms, ocean research, energy and the mineral sector can be part of it. Towards the end of his address, he went back on the attack against the current government that he wants to replace. This time he got personal, accusing some government ministers of “threatening boycotts of media they don’t like, closing their eyes to climate change, using research too freely, ignoring the rise in financial differences among Norwegians, launching a “crusade” against Islam and being suspicious of refugees. In addition to called for “jobs for everyone,” he also claimed that Labour will promote safe workplaces, good schools, security for the elderly and a “climate friendly society.” He didn’t get into how that can occur while his party otherwise supports the oil and gas industry, as does the current government. More details are due to emerge after party faithful debate and hammer out their program heading into the election campaign.